M3000, Reverb from TC Electronic. Bout'chou's review (This content has been automatically translated from French)" Great!" it is a multi-effects mainly focused reverb. But even with more efficient algorithms great! For the rest all was said in other reviews. However I ragouterais that manufacturing has really nothing to do with what I have used before! 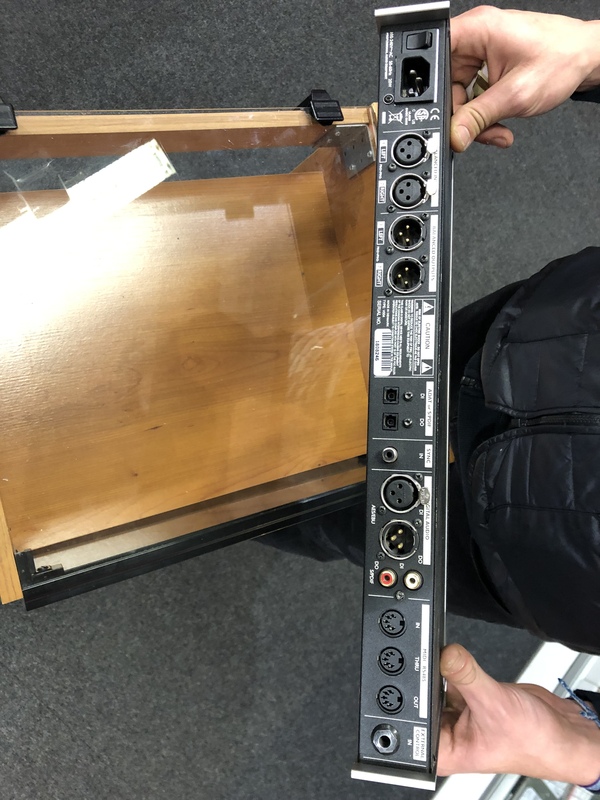 The quality of the jacks are used to connect the M3000 to other devices as well as buttons that adorn the front are super quality. And frankly it's great fun to use! The handling of the M3000 is very intuitive, childlike limited by time. In fact it is great thought, at any time you find yourself lost in menus or editing pages, wondering what we're doing here! With hindsight I think it's a feat so are many parameters! So many before my purchase the small screen made me a little scared. I was afraid of its size, have to find me trying to decipher endless parameters names rendered exotic and incomprehensible force of beings abbreviated "SMS language" for lack of space. Well, actually not. What makes the learning much easier. The buttons are really well placed and stored in a perfectly logical order. It may sound silly, but my little experience I've lost a lot of time wondering where could well be a specific button! The reverbs are really beautiful! It's true that I do not have many points of comparison, but really they have kidney to do with what I have used so far (MidiVerb4, Zoom 1201 and Lxp 5 and some poor plugins I have in my possession). I've always tended to put a little too much reverb everywhere, so all my other multi-effects with my results were often disastrous, it's still pretty much where whatever settings and dosage! That makes eight months that I have, so I'm still in learning mode! I always discover new things and new effects to do. If you're like me, that is not a pro, and not particularly good with technology, do not hesitate to ask for advice and tips for those mastering perfectly the M3000, because it can do a lot more things that it seems! The rest is really just happiness. Stunning reverb, chorus and flanger beautiful, EQ and compressor nice and super easy to use. This is the first time I buy a really professional rack, and sincerely I do not regret anything so the M3000 brings me surprises over the years and my sound experiments. Besides it is with this kind of device we really want to learn and understand what you are doing! blackle's review (This content has been automatically translated from French)"A M 3000 and me and me and me .."
and finally a esser ..
On the rear panel there are all that is needed to interface the M 3000, analog inputs and outputs on XLR symmetrical active. Regarding digital, this machine offers a very complete device: Input / output to ADAT Toskink switchable S / PDIF inputs / outputs on XLR AES / EBU and finally inputs / outputs on RCA format ... (rolling drum) S / PDIF. It is very comprehensive and allows to interface smoothly in a particular hardware .. followed by four plugs DIN MIDI protocol and responding to input Jack finally called "External Control" to remotely control various machine Bypass and Tap Tempo. Regarding the visualization of what happens in the machine, with its Tc M 3000 Led a multitude of caring for display input levels, as well as an overload due to signals input too muscular .. but also the sampling frequency selected (ranging from 32 to 48kHz), a witness acknowledged MIDI signals with LED flashing to the rhythm of tap tempo, the presence of a memory card and the action of the function called Morphing. We must also add that all switches offer a feature that Tc was considered important, the Danish manufacturer has incorporated some key reporting a Led .. It is pro at Tc Electronic ..
To be clear, these methods work thus allow mixtures of owls in style: more reverb or pitch more reverb chorus in series, reverbs separate dual mono mode, plus reverb or compressor in parallel .. This put you to choose your operating modes, as us, the last example I just quoted has absolutely no interest ..
All settings whether the routing of many and varied configurations, through editing effects itself are practically live access. A = a menu key, and the function hierarchy is no page like home Lexicon or Eventide, but drop-down menus. It is pretty obvious comfort .. certainly a comfort .. but this is not counting on that damn wheel that does not account for the speed .. at home .. Lexicon precisely! So hello towers increment and decrement to go eg preset 1 to preset 448 .. You will need a good dose of patient with a few pain in the forearm, including the wrist! All that to get to the Wizard which is also present on the M 2000, and reminder, I quote my wife: ".. is a research system that offers first choose the type of algorithm that we wish to use and then define which source to apply .. "And my dear and better half, there are now more than two years, were compared in its opinion on the M 2000 precisely, a brand of deodorant inside .. Pschitt Pschitt! So much on the 2000 model are use is not mandatory, as the M 3000 I&#39;ll advise you to use it because, as stated above, the wheel is a bit long to relax ..
* Morphing. I quote my wife again: ".. the function called morphing allows smooth moving from one effect to another with a dynamically changing effects depending on the signal level .. "What is it completely .. In other words, it is a dynamic transition between the two DSP (fading faster or slower) of the two preset effects, using as the trigger input level. Put simply, if your turbo singer passes, you will discover with pleasure that the 3000 M will, in absolute silence, the second tipped onboard DSP, or even where you have loaded an effect putting more value in this passage muscular. . It therefore requires such a long reverberation to a shorter, following the signal envelope, and all on the same two outputs. In all lords all honor .. start with the reverberations. They are particularly successful without necessarily being an absolute realism, in all cases they are much better than the 2000 M it is true at times of very precise uses does barely better than M-One (for reverbs eh ..). We note immediately the disappearance of waves at low frequencies and especially this aspect relatively artificial high frequencies for the reverb (metallization if you prefer). There with this model is clear and rarely aggressive. More unlike M 2000 just a few additional parameters allow to soften reverb tails .. and it is very effective! Other effects far from trivial, are also very good and especially the pitch Shiffer, without equal tenor in the field Eventide. Shiffer you pitch it will develop a beautiful chorus depth! Flanger Phaser and other are also very successful. However you should not expect any miracles on to the compressor and even less embedded esser .. If you think of using the compressor alone you will quickly disillusioned .. in a word .. it sounds very small .. Moreover, to my knowledge and staying within budgets say decent, one of the few reverbs with a compressor perfectly usable as such is the Yamaha Pro R3. If you are looking for a good reverb typical Tc Electronic suggesting other effects to combine them so perfectly simple and intuitive, this M 3000 could well be the bike you are looking for .. If you are looking for a quality reverb can be sufficient in itself, this M 3000 is sure to be the bike you are looking for .. If you are looking for a reverb sharp and capable of realism is the Reverb 4000 that you need ..
To make it short, this is a very good model causing its color very personal, simple to use, as long as you do not venture too far into the settings pushed too much cottoned before operation, and what particular parameter change subtly or not a program. It is far from an M-One .. Above all, the M3000 is a reverb and we feel that the engineers have focused on this part as the presets and settings available are numerous! At the "big" part is added some effects of very good usable as pre-post prod. Nothing to complain about what is the essence of this machine! Note that the reverb effect consists of two sections, which can be useful in some cases ... To be clear, if you want to use a reverb and a phaser at the same time, we can! Each section is identical to another, but separated from the ci ... thereby to adjust each of the two effects separately ... and send them on different return, allowing to dose one and Lautre using the mixer. We regret any time without a software editor for pc / mac because buttons are fine and the wheel, not very practical given the number of presets! The M3000 rack format, which in addition to its hefty price tag indicates that this product is intended for good musicians for whom music is more than just a leisure Sunday afternoon! I prefer what effects, and those that I hate? The advantage: its large bank and the quality of it! Its less: the wheel that can "navigate" in the bank if laaaaaaarge! The value for money is ... just ... in several directions: just because the effects are numerous and very good ... Professional! 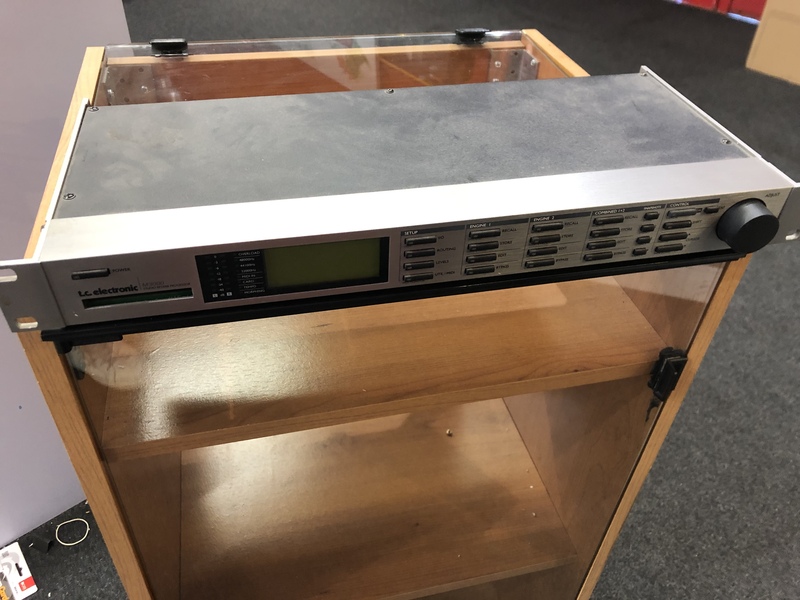 Currently, you can find this unit for a price ranging from simple to double ... then, if you pay 979 euros in home studio, the price / quality ratio is very good ... if you go to a conccurent who sells more than 2000 euros ... do not buy! This is the black spot of this device: the wheel! When our favorite effect is in number 148, for example, from 1 ... and turns ... turning ... turning ... to achieve the effect 148 ... sometimes tedious! The manual ... not read! Not very well and not very useful indeed!